The Buntyn family writes tribute to late grandmother who raised them in their new book. This book is a reminder of the good things that have been lost, but can be found again. Cornbread, soaked in buttermilk is an old-fashioned, southern delicacy. For Billy (pen name) Buntyn and his siblings, it symbolizes the love and sacrifice of their late-grandmother, who raised them, single-handedly, to have faith in God, get an education and maintain family values. 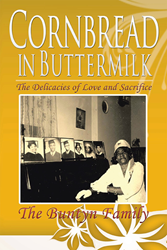 “Cornbread in Buttermilk: The Delicacies of Love and Sacrifice,” by the Buntyn family is a heartwarming tribute to and biographical account of the life of Emma Lee Buntyn, affectionately known as Pappie by her grandchildren. Billy Buntyn, described as the “rebel” of the six children, went from almost failing out of high school and serving time in jail to earning his PhD and working full time in pastoral ministry. For more information, visit: http://www.thebuntynfamily.com/. Dr. (Billy) Buntyn is a teacher, certified by the Texas Board of Education, an ordained and licensed preacher and skilled in the culinary arts. He contributed a collection of poems to the book, as well. Bernadine is the youngest Buntyn and a sign language interpreter. Her twin sister, Bernadette, is retired but serving full-time as an ordained, licensed minister. Ina was a singer and had a joyful heart. She passed before the book was completed. Cynthia, who is also a singer, attended Lehman College, got married and raised three, beautiful children. Paul was drafted during the war in Vietnam. During his time in the U. S. Marine Corps, he was awarded several honors, including a Purple Heart. He is presently pastoring in San Marcos, Tex.